Empire War is a real-time strategy game performed by having a huge war between mankind and chaos – other races such as devils or monsters – as the background. 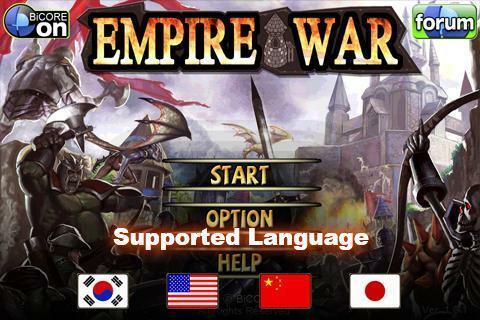 Empire War game can be played easily even by a player encountering the game for the first time and made to experience the enjoyment instantly through the control system optimized for mobile devices and simple screen configuration. The player is also able to spread colorful strategies through the growth system to reinforce the player’s own camp using various methods or the configuration of six hero characters representing two camps and 14 types of units having unique personality. : You can make all buildings or units appearing in the game grown using the ‘Cubic’ gained while playing the game. The player gets to lead the game flow by the reinforcement of friendly force according to the player’s own unique strategy such as encouraging the friendly force by yelling out or poisoning the enemy. : The hero units may appear only 1 person at a time on one stage unlike the regular units appearing in groups while producing units are so powerful that it can confront the enemy troops single-handed. The player is able to play the battle with a hero that the player has selected among a tough warrior striking sword, a magician with powerful magic or a paladin surrounding himself with holiness. Also, the war situation can be reversed at once at a critical situation if you acquire special skills by raising hero units. : The player is able to build a ‘Tower’ backing up the friendly force with powerful attack by certain time intervals if necessary as well as the buildings for producing units. Various towers from the ones shooting arrows to the ones shooting cannons can be placed using ‘Cubic’ the same way as units. You can form up the backup attack with your own unique method such as giving huge damage to a target point or making an extensive area surrounded by fire through the final enchantment. : You can experience more enjoyment through the additional configured in this game. The < Defense Mode > also has implemented both the “‘road rule’ blocking the moving enemy along the preset road” and the “’field’ rule in which the player arranges buildings directly and controls the moving path of the enemy” that are most popular two types of rules with their proven amusement. : Four languages of Korean, English, Japanese and Chinese are supported so that the player using the corresponding language is able to become absorbed into the game even more. Awesome time killer! You could be playing n playing for hours till u forgot that you have other important things to do..
for maaaany hours, not only for 1 hour like so many other android games! Really fun to play. includes different game modes. Great defense game with hours of gameplay and tons of levels. On top of it being awsome the levels vary on difficulty making it fun but can kill you some times. Otherwise absolutely amazing.